On the Day of Pentecost, when the apostle Peter addressed the crowd, the people were 'cut to the heart' and asked how they should respond to what they had just heard (Acts 2:37). According to the letter to the Hebrews, 'the word of God is alive and active. Sharper than any double-edged sword, it penetrates even to dividing soul and spirit, joints and marrow; it judges the thoughts and attitudes of the heart' (Heb. 4:12). However, while God's Word is sharp, teachers and preachers of the Bible can too easily make it blunt. The Word is fresh, but it can be made stale. The Word is living, but it can be stifled. As a result, our practice does not 'cut to the heart' and transform lives in the way that it should. Chris Green has observed that while there is an enormous range of contemporary resources on teaching and preaching the Bible, from the complex issues of hermeneutics, through careful exegetical practice, to debates about style and communication, there are far fewer on the issue of application, and what God intends to do through his inspired Word. So he seeks to place something at that point of study and preparation, to encourage further reflection. We need to find out more about how the Bible says people are to change to become more Christ-like; we need to go back to the Bible and discover what it says about what it is for. The issues touched by 'application' range deep and wide. Green's focus is on personal and corporate application to Christians, and his exploration is structured under six questions. Why has God given us a relevant Bible? How is the Bible supposed to be relevant? How does the Bible apply the Bible? How does it address the heart, engage our attention and apply to different kinds of people? All teachers and preachers of the living and active Word of God will benefit from Green's distinctive and accessible study of principles, patterns and parameters for application. Cutting to the Heart by Chris Green was published by IVP in June 2015 and is our 36575th best seller. 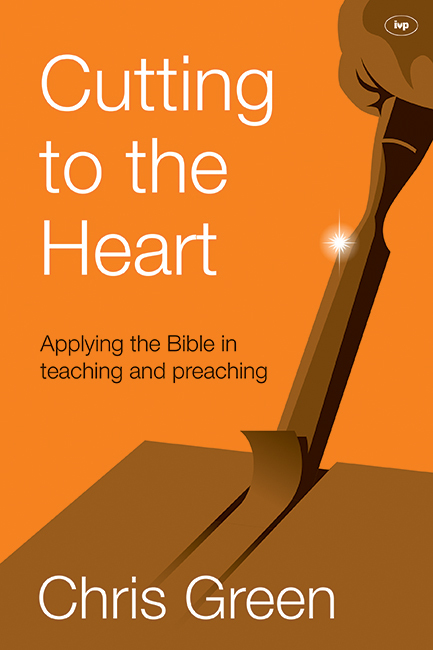 The ISBN for Cutting to the Heart is 9781783592937. Be the first to review Cutting to the Heart! Got a question? No problem! Just click here to ask us about Cutting to the Heart.